Edgbaston and Old Trafford have been allocated Ashes Tests for 2019 by the England and Wales Cricket Board (ECB). 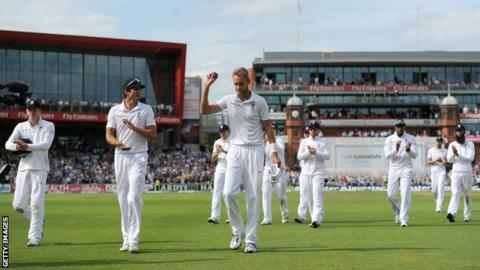 The other three venues - Headingley, Lord's and The Oval - had already been awarded the England v Australia games. The ECB will recommend Lord's to the International Cricket Council (ICC) to host the World Cup final in 2019 and the Women's World Cup final in 2017. The Oval, Edgbaston and Cardiff are set to be the three host venues for the ICC Champions Trophy in 2017. The same three grounds hosted the 2013 event, when the final was at Edgbaston - but the 2017 final is set to take place at The Oval, which staged the 2004 final. The Oval will also be the venue for the opening 2019 World Cup game, with Edgbaston and Old Trafford hosting the semi-finals, with group matches also taking place at Taunton (which last staged a men's international at the 1999 tournament), Chester-le-Street, Headingley, Trent Bridge, Cardiff, Bristol and Southampton. In 2013, the ECB announced 10 venues would be selected for the tournament, but 11 are now being proposed. Meanwhile, Lord's will host the men's World Cup final for the fifth time (after 1975, 1979, 1983 and 1999), and the women's final for the second time (after 1993). All venues for those three ICC tournaments are subject to the international governing body's approval, with the ECB set to recommend the other Women's World Cup venues to the ICC in April. Also in 2019, Lord's will host a game between England and the winners of the ICC Test Challenge, which is a play-off which will take place every four years from 2018 between the lowest-ranked Test team and the winners of the ICC Intercontinental Cup. All venues are listed in alphabetical rather than fixture/chronological order.